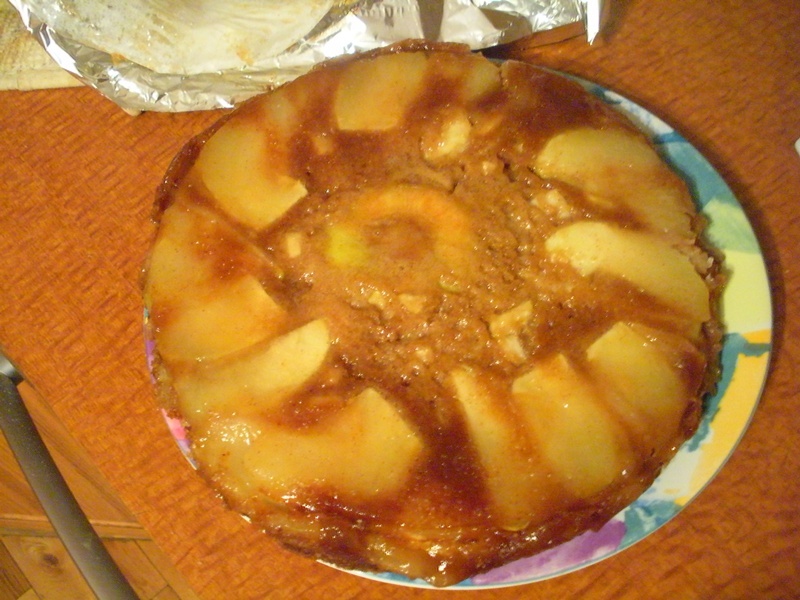 The second recipe I made to help get rid of the huge bag of apples I brought back from NH was apple upside-down cake. I’m horrible at cutting evenly, but once you’ve got the apples prepped, this cake comes together pretty quickly and easily. Lightly grease a 9″ cake pan with sides at least 2″ tall. Line the bottom with parchment and re-grease. Slice the top off one of the two medium apples, leaving the stem attached if there is one. Set aside, then peel and slice the remainder of that and the other medium apple into 1/4″ thick wedges. Place the apple top stem-down in the middle of your prepared pan, and arrange the apple wedges in a ring around it. Set the pan aside and prepare the rest of the topping by combining the butter, sugar, cider, cinnamon, and corn syrup in a pot over low heat. 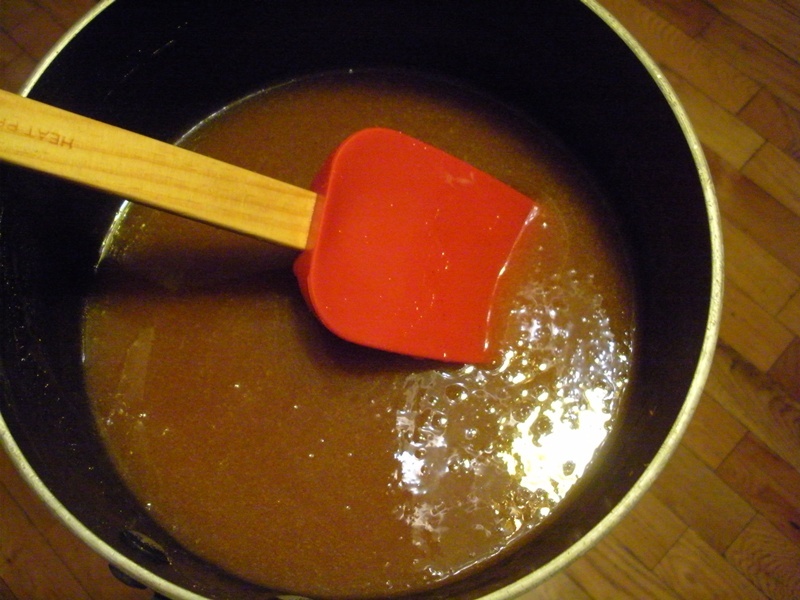 Stir until the sugar and butter are dissolved and evenly mixed in. 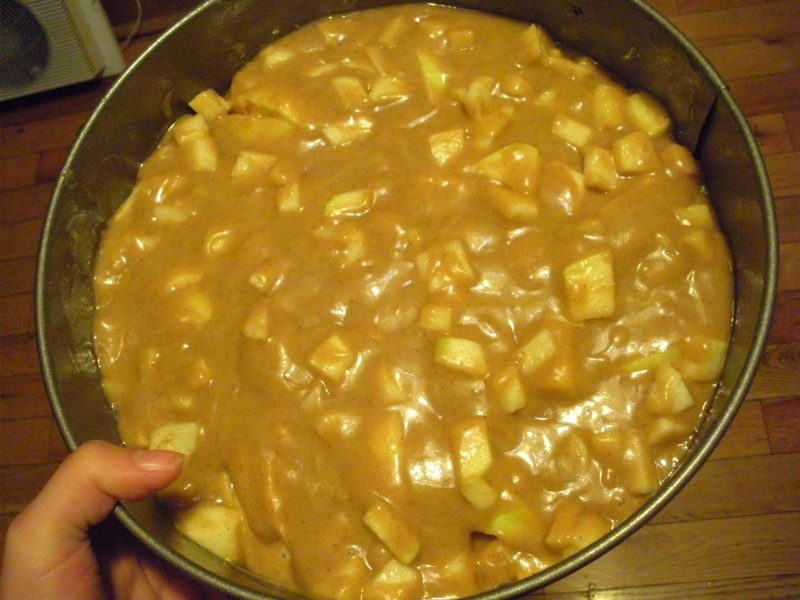 Pour 1/2 cup of the mixture over the prepared apples in the pan, and set the rest aside. To make the cake, beat the oil, brown sugar, boiled cider, eggs, spices, and salt together for 2 minutes at medium speed. Mix the flour and baking soda together in a small bowl, and stir it into the batter until just blended. Fold in the chopped apples and if you’re using nuts, throw them in too. Spoon the batter over the apples in the pan, gently spreading it to cover the apples evenly. Bake the cake for 50-55 minutes, until a toothpick inserted near the center comes out clean. I somehow failed at this test, as the middle of mine turned out to be still somewhat undercooked when i flipped it, so…be careful? Make sure you’re stabbing all the way in, not just stopping on an apple chunk right below the surface. After removing the cake from the oven, run a thin spatula or knife around the edge of the cake to loosen it from the sides of the pan, then allow it to cool for five minutes. 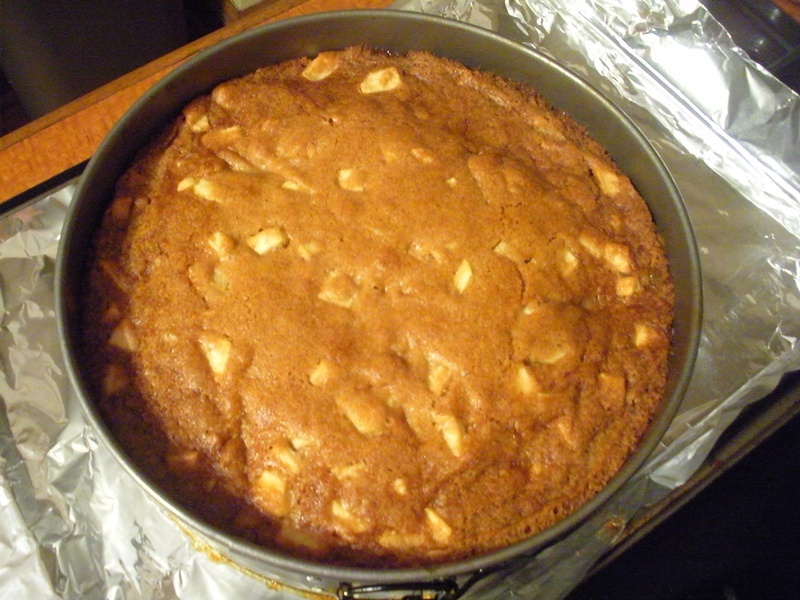 After the brief cool, flip the cake out onto a serving plate, apple-side up. Scrape any sauce remaining in the pan onto the cake. Reheat the reserved topping and pour over the cake. If the butter has separated and isn’t stirring back into the mixture, add water one tablespoon at a time until it does melt back in. I realized in time that this cake was nearly the size of all my biggest plates, so I cut it roughly in half and put it on two plates before pouring sauce over it so that I didn’t just end up making a ridiculous mess all over the counters. Not as grand looking, but…prudent, with the plates I’ve got to work with. Not the most attractive thing I’ve ever made, but apple and brown sugar is a hard to deny combo. If you’ve got a large serving plate, go to it and find out for yourself how good this could look! Preheat the oven to 350. Lightly grease a 9″ round cake pan with 2″ or taller walls. Line with parchment and re-grease. Slice the top off one of the two medium apples, leaving the stem attached. Set aside, then peel and slice the remainder of that and the other medium apple into 1/4″ thick wedges. 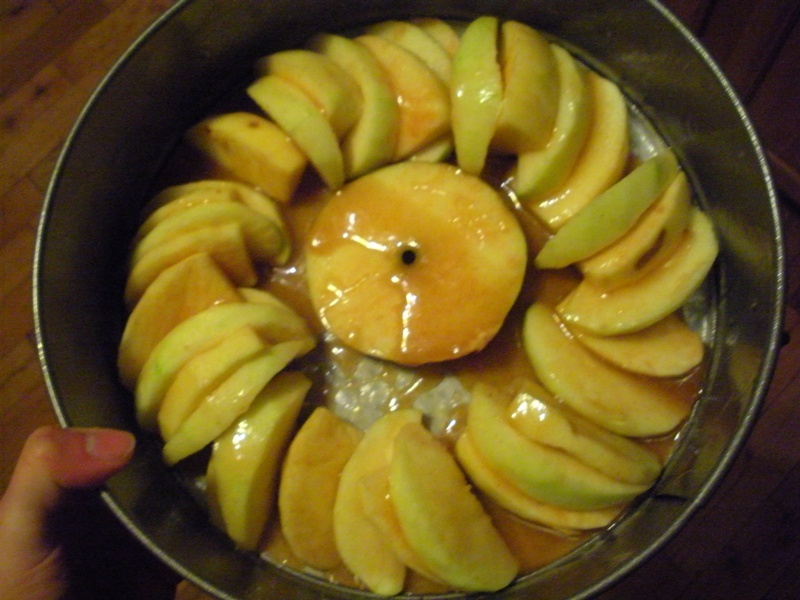 Place the apple top, stem down, in the middle of your prepared pan, and layer the apple wedges in a ring around it. Set the cake pan aside. Prepare the remainder of the topping by combining the butter, sugar, cider, cinnamon, and corn syrup in a pot over low heat. Stir until all ingredients are dissolved and evenly mixed in. 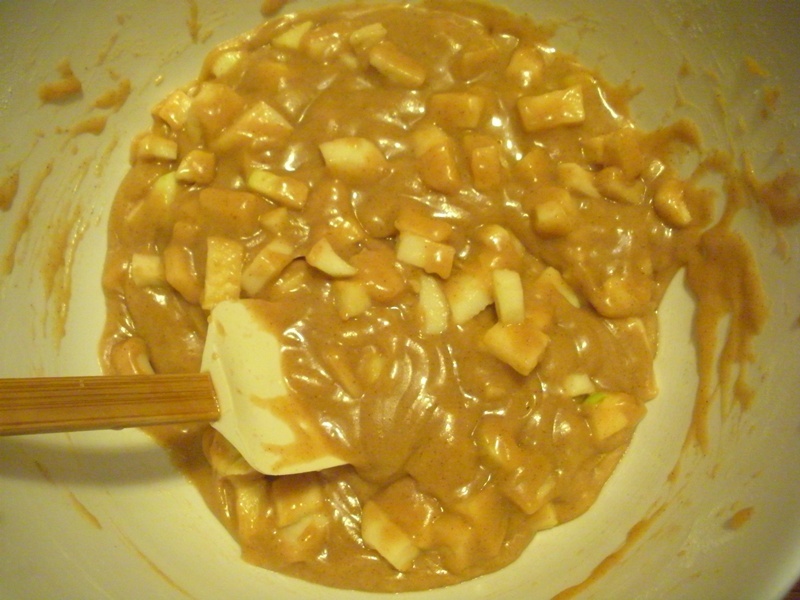 Pour 1/2 cup of the mixture over the prepared apples in the pan, and set the rest aside. 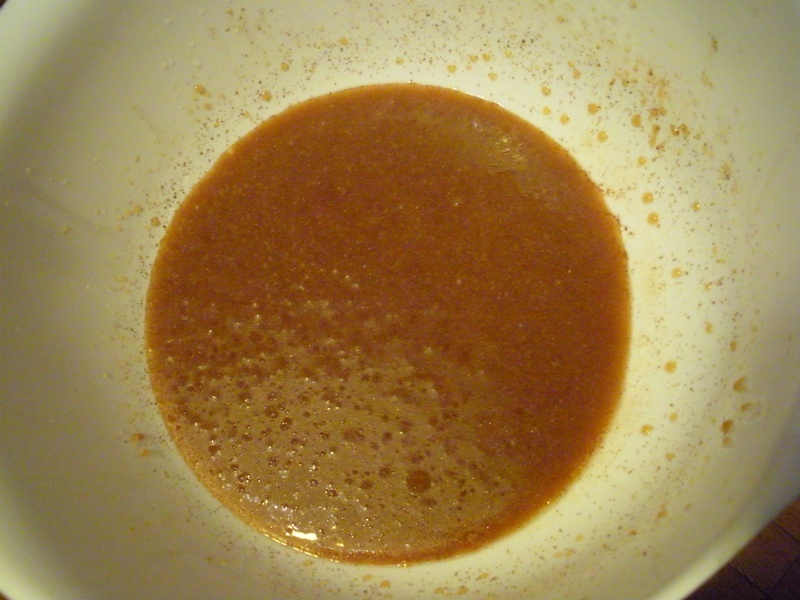 Mix the flour and baking soda together in a small bowl, and stir it into the batter until just blended. Fold in the chopped apples and nuts. Bake the cake for 50-55 minutes, until a toothpick inserted near the center comes out clean. Run a thin spatula or knife around the edge of the cake to loosen it from the sides of the pan, then allow it to cool for five minutes. Flip the cake out onto a serving plate, apple-side up. Scrape any sauce remaining in the pan onto the cake. Reheat the reserved topping and pour over the cake. If the butter has separated and isn’t stirring back into the mixture, add water one tablespoon at a time until it does melt back in. Serve warm or room temperature, and with whipped cream if desired. 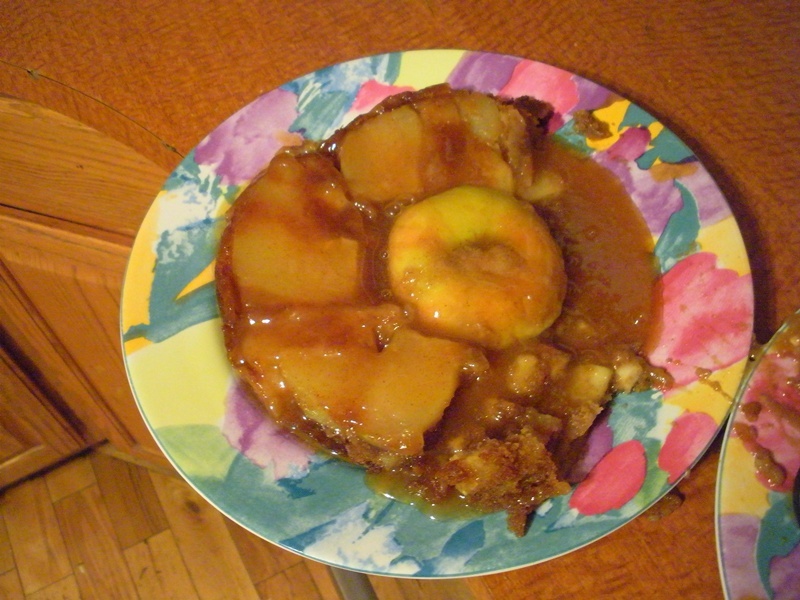 This entry was posted in Dessert and tagged Apple, upside-down cake. Bookmark the permalink.